The Swiss National Bank (SNB) said the pact will “promote the use of the renminbi by enterprises and financial institutions in their transactions and help facilitate bilateral trade and investment. ZURICH, Switzerland- State-owned China Construction Bank (CCB) is expected to open a Swiss branch during 2015, the Swiss finance minister was quoted on Saturday as saying, following a deal to establish clearing arrangements in Switzerland for trading in China’s currency. Switzerland is keen to attract a Chinese bank to help strengthen its case to be a major trading hub in China’s renminbi currency. “The aim is that the China Construction Bank has a hub in Switzerland by the end of this year,” Swiss newswire SDA quoted Finance Minister Eveline Widmer-Schlumpf as saying on the sidelines of the World Economic Forum in Davos. Widmer-Schlumpf said the bank had shown a clear desire to set up a branch in Switzerland, either in Geneva or Zurich, but that it had not yet filed an application and that a few regulatory questions needed to be answered first. A spokesman for the Swiss finance department confirmed Widmer-Schlumpf’s comments. A spokesman for CCB declined to comment. 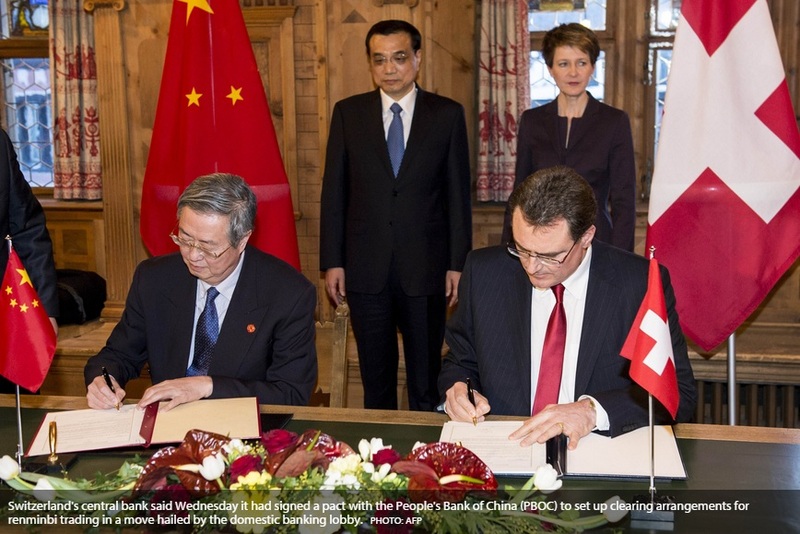 The news came after an agreement this week between the Swiss National Bank and the People’s Bank of China to establish clearing arrangements in Switzerland for trading of the renminbi and to extend a pilot scheme for clients of Swiss banks. Transactions in China’s currency have been impractical until recently for all but very large European companies that are able to involve China’s central bank in a deal because the renminbi is not freely convertible. In the past five years, China has promoted use of the yuan for trade and investment, and also as a reserve currency to help lower currency risks for Chinese companies and challenge the dollar’s global dominance over the long term.